I cannot believe how quickly a year has gone by. As the weekend neared, the excitement laced with large drops of trepidation intoxicated my every movement. It was never about not holidaying with the family, but rather more joining my other family; my very special Swanwick family. A year on and I was still a fraudster in some eyes particularly those of my children, who cannot understand how I could legitimately join a writers school,having not had my novel published. The few magazine articles I had sold were at most luck; at least an embarrassment so they could not count towards my job title WRITER. Let’s face it, my children had not seen sight of any profits from my articles. Why would they? My promise to myself was to put them towards my next Swanwick trip and so I had. It was my eyes and my feelings that counted. 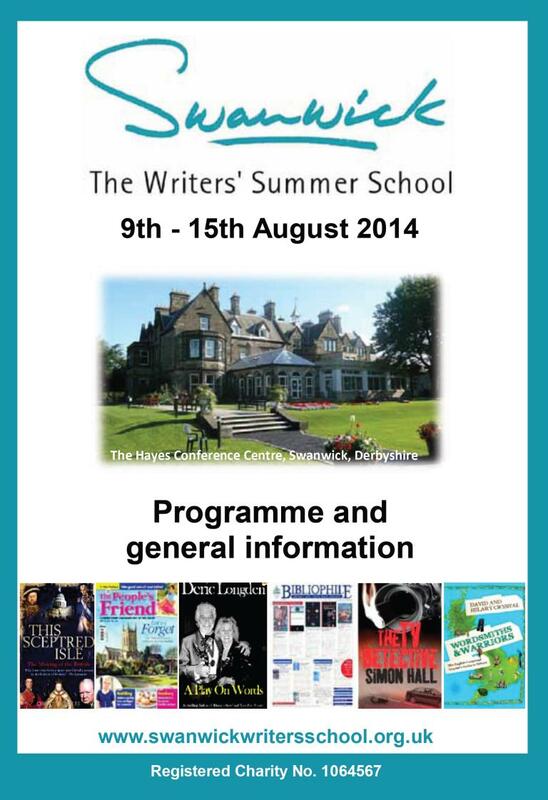 I was returning to Swanwick School of Writers, and I could not wait. The journey proved longer this year, being held up in a traffic jam and on my own for the whole trip. Excitement escalating with each excruciatingly slow mile. Was I nearly there yet? Again (2013 Swanwick) I paused at the entrance, savouring the cocktail of emotions that coursed through my being. I admit a certain fear and apprehension as I drove up the drive; would they remember me, would it be the same if I was not a white badger, nobody was going to offer guidance or assistance. Maybe my followers and friends from last year will have realised in the intervening months just how flimsy my writing career is. It was strangely reassuring to arrive at my room and realise I had stayed in this one last time. A small task of individualising my name card reminded me that I was back in the world of writers, authors and poets with learning and fun to be had for a whole six days. Taking a large gulp of self-assurance I made my way to the bar where I found welcoming arms and hugs from old and soon to be new friends. I began with David Hough’s Novel Editing. He poured out sound advice, breaking it down into bite size re-edits. In a nutshell; read it for me – is it what I wanted to read. Read it from my main characters point of view – does she see things she shouldn’t or know things she hasn’t been party to yet? Read it from my reader’s point of view – does it entertain them? Then comes the grammar and spelling edits; this could be where I might fall down. Back to the drawing board with Memories I realise now that I am further back than I thought – I may get away with missing step 1 as I am pretty sure it has all the bits in I wanted to add. Short stories with Della Galton proved entertaining, challenging as she set the task of writing our opening paragraph and insightful with her simple plan; A character has a problem, which is resolved in an unexpected but in a satisfactory way. The character is changed along the way. With lots of tips and advice available to help craft my stories and make them marketable; we ended the week looking at short story markets. Joining a workshop with Shirley Blair, the very lady who has the power to reject/ accept my stories, telling me to keep sending and her rejections are not personal. With her mix of stringent guidelines spiked with pushing the boundaries she has thrown down the gauntlet to get a published story in People’s Friend. Then the TV Detective himself arrived into my week. The man who made me cry with laughter with his after dinner speaking- I will never think of otters again in the same light. Simon Hall was dispensing in his first workshop about the media. How to sell myself to become an item of newsworthiness even before the book has been published. He drizzled into conversation facts like; agents check out web sites and look at tweets to gain insight into my personality and writing styles. He added to the brew suggestions like offer to write the article for the local paper and how to impassion that interview. A short workshop earlier in the week on the luck and skill involved in forensics had left me wanting more. Simon Hall again stirred the emotions of anticipation, fear and excitement with his rapid crime writing workshops. Mystery, suspense and keep your reader wanting was how he kept me enthralled. Introducing the five Ps of writing a good novel: Premièring, place, people, plots and persistence. Blending these five ingredients together should give me the recipe for a successful novel be it crime related or other genre. There were other workshops, other inspirational speakers, the emotive and sometimes harrowing pictures that accompanied music, poems and letters in Remembering WW1. The writer’s quiz that proved to me how wide and diverse this writing subject is and how little I know. The poignancy of singing the final rendition of Auld Lang Syne as we promised not to forget each other amid tears and hugs of laughter. No matter how many sessions I managed to attend there were many many others I could not make. Before I knew it the week was over and I was waving off good friends and promising to keep in touch and see you next year. Alone I gathered my belongings and packed the car. Procrastinating long enough to take in the quiet and the gentle ripple of the lake I said my farewell vowing to return again. So the magic of Swanwick (Swanwick 2013 part 3) lives on; as I drove down the long drive the sudden strong sense of my own identity overwhelmed me. I knew who I was and I knew where I was going. The journey would be longer than I hoped but I had all the elements to quench the thirst to advance my writing career. Icy trepidation diluted the fiery fervour as I realise returning to real life will get in the way, work will inhibit both time and creativity as I head back to a world of people who do not understand but, I know I am on the path and heading in the direction I want to be going. This entry was posted in Writing and tagged challenges, emotion, speakers, SWANWICK, workshops, writing, ww1. Bookmark the permalink. Attempting to make it as a writer, whilst working full time, and being wife and mother to three boys. Huge fan of both NANOWRIMO and Swanwick Writing School.